See how LNG supply around the world is changing. Understand event impact. Identify opportunities. Individual events very quickly affect LNG markets – so when something changes you need to know what impact it has. LNG Supply Forecast lets you see up to two years ahead, drill down by month and, crucially, compare how the forecast adjusts immediately after every event occurs. 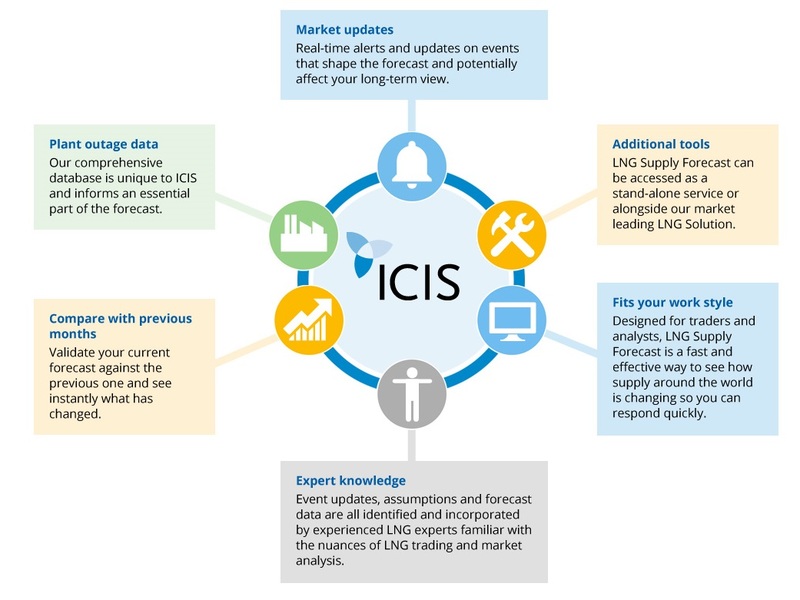 What is ICIS LNG Supply Forecast? Making a judgement call about what to do after a key event is so much more comfortable when you can see what practical difference it makes to the overall forecast. Small mistakes can become very visible on a long-term forecast. Use the monthly granularity and real time adjustments to ensure your forecasting is robust (and your reputation stays intact). Access to plenty of information is important – but too much can cause confusion. LNG Supply Forecast brings everything together, letting you see ahead clearly and look ahead with confidence. There’s no point discovering supply-driven price changes when it’s too late to respond. With LNG Supply Forecast you can see what is needed in plenty of time. A consolidated service with visual data presentation and supporting detail that can be digested and interrogated quickly and saves you time. Impact events often create new opportunities to make money. LNG Supply Forecast ensures you can soon spot when there’s a chance to benefit. Who is the LNG Supply Forecast for? The fragile balance of long-term global LNG supply soon shifts when events occur that affect volume. Accurate forecasting is vital for LNG traders and analysts; it also impacts profit for utilities and integrated energy companies. But it’s incredibly hard to be confident when plant outages, new gas supply, plant start-ups, gas rerouting, debottlenecking and other events put your careful assumptions out of kilter. Our constantly updated two-year forecast takes the pressure off. Our LNG experts focus on keeping abreast of events as they occur, interpreting the impact, and then updating the forecast instantly. That way, you get the most up-to-date view of what’s changed and why it matters. Choose to act immediately – or combine and contrast our forecast with your internal sources for further validation. Either way, you’ll enjoy increased confidence in your forward view. European natural gas liquidity higher than Q2 2017, across all major markets. The July 2018 issue of the European Gas Hub Report gives you an update on the European landscape, with in-depth coverage of prices, liquidity data, trade volumes and developments across 22 gas hubs. Global LNG imports increased by 7% year-on-year in the second quarter (Q2) of 2018, with continued strong growth in demand from China. China saw a 40% year-on-year increase in its Q2 imports, slowing a little from the annual growth rate seen over the winter, but still providing a major boost to the global consumption. The LNG Edge: Q2 2018 Trade Flow Report draws on the latest voyage data from the market-intelligence platform, LNG Edge, to analyse imports and exports in the global LNG market, bringing you key insights ahead of full data publication from the customs authorities. The report includes a review of spot price movements during April to June and a look ahead to the important factors likely to drive the market in the third quarter of the year. Global LNG market supply has been tighter than expected, primarily due to high demand from Asia, as well as strong US deliveries to markets closer to the Americas. ICIS deputy editor of LNG Europe, Alex Thackrah, discusses why Asian companies are looking to the Dutch TTF and the UK’s NBP for cargoes with flexible destinations. The LNG Edge: Q1 2018 Trade Flow Report draws on the latest voyage data from market-intelligence platform LNG Edge to analyse imports and exports in the global LNG market, bringing you market insights ahead of full data publication from customs authorities. The report includes a review of spot price movements during January to March and a look ahead to important factors for the market this summer.